It's a good one for this time of year as we are asking for 'clean and simple' Christmas projects. 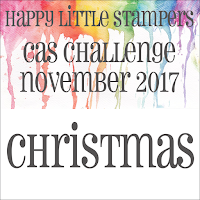 I wanted to make a CAS shaker card and I think I managed it! I used the negative die cut to make the shaker section and then used the positive section to hang just above it. I decided to emboss the top bauble to give it some texture. The sentiment is from Happy Little Stampers but it is a retired set. Here I stamped it in delicata silver ink. 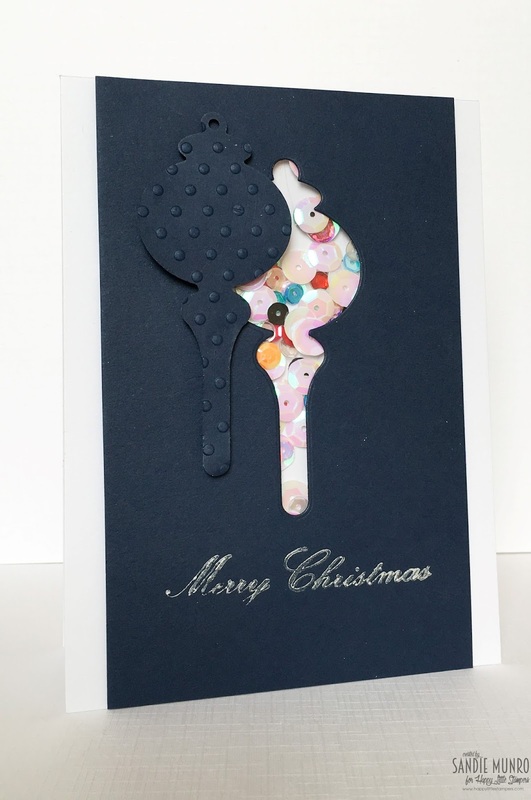 We are looking forward to seeing what you create and if you need more inspiration, pop over to our blog here and see the amazing cards our DT have made. The winner of this challenge will get a $20 voucher to use in the store. Your ornament is lovely and how clever to transform it into a shaker! Pretty, plus! Oh, Sandie! So much detail is in your card. I love the shaker type cards, they are fun and full of movement. I like that you stamped positive die, because he added more dimension to the card. Your card is unique. Look at you making shaker cards! This is definitely CAS and fabulous!